This award was created in 2009 by RCAP to honor Ryan White and persons who have made significant, national and/or international achievements in HIV/AIDS prevention. Ryan White, a rural, Indiana youth, contracted HIV in 1984 and became a national poster boy on AIDS until his death in 1990, a few months prior to his intended enrollment at Indiana University, Bloomington. The award plaque given to each recipient reads "in appreciation for your outstanding contributions to HIV/AIDS prevention and for being an exemplary bearer of the standard of excellence and commitment needed to combat HIV/AIDS." 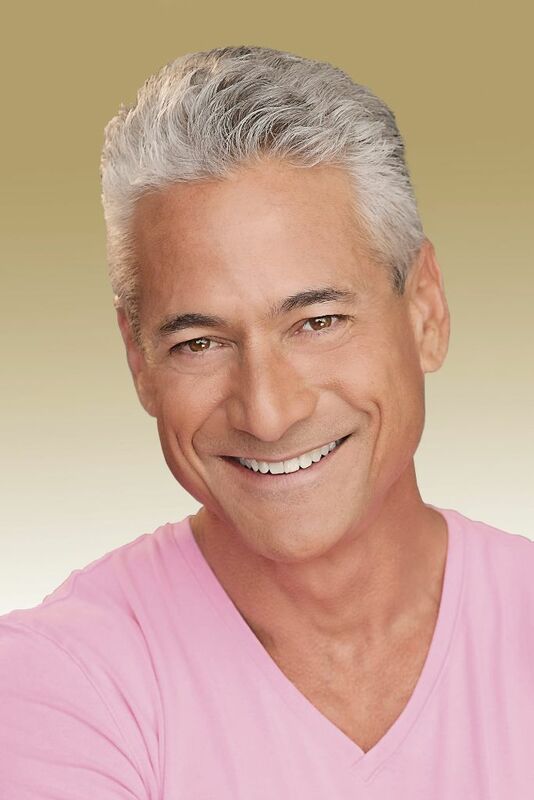 Greg Louganis received the eighth Ryan White Distinguished Leadership Award at the inaugural Ryan White and William L. Yarber Lecture on March 1, 2016, sponsored by the Rural Center for AIDS/STD Prevention (RCAP) and the Indiana University School of Public Health-Bloomington and conducted on the IU campus. The award was presented by Dr. William L. Yarber, RCAP senior director, and Jeanne White Ginder, Ryan's mother. Greg's presentation was Overcoming Adversity From an HIV Positive Legend, the inaugural Ryan White and William L. Yarber Lecture Series address. Ryan White Leadership AwardGreg is considered by many as the greatest diver ever. He is the only male to sweep both the 3m and 10m diving events in consecutive Olympic Games ('84 and '88). He earned a total of five Olympic medals, five World Championships titles, and 47 national titles (more than anyone is US history). Knowing and remembering Greg only for his unsurpassed athletic greatness leaves out his touching and powerful personal story that is an inspiration to all. He has experienced truly harrowing social, emotional, and family circumstances that nearly destroyed him. Despite all that he faced, he found the inner strength to save himself. The Rural Center for AIDS/STD Prevention presented the 2015 Ryan White Distinguished Leadership Award posthumously to Joep Lange, MD, PhD, on October 14, 2014 in Amsterdam, Netherlands. Dr. Lange was professor of medicine and head of the Department of Global Health at the University of Amsterdam, Netherlands, and was a passenger on the Malaysian Airlines Flight ML 17 that tragically crash in eastern Ukraine, July 17, 2014. "Dr. Lange was a world-renowned leader in HIV/AIDS prevention and the architect of several pivotal trails on antiretroviral therapy and the prevention of mother-to-child transmission of HIV in both the developed and developing countries. The world lost a pioneer and 'giant' in global efforts to combat AIDS; certainly he is a worthy recipient of the prestigious Ryan White Distinguished Leadership Award," said Dr. William L. Yarber, RCAP senior director. awardDr. Lange published more than 400 papers in peer-reviewed journals and guided more than 30 doctoral students. Not only was he a superb scientist and clinician, he advocated for affordable AIDS medication to African countries. Dr. Yarber and Jeanne White Ginder, Ryan's mother, presented the award to Dr. Lange's son, Max, at an internationally-attended academic forum on HIV/AIDS conducted in honor of Dr. Lange as shown in the photo (© Rebke Klokke). Also shown is a photo of Dr. Lange. 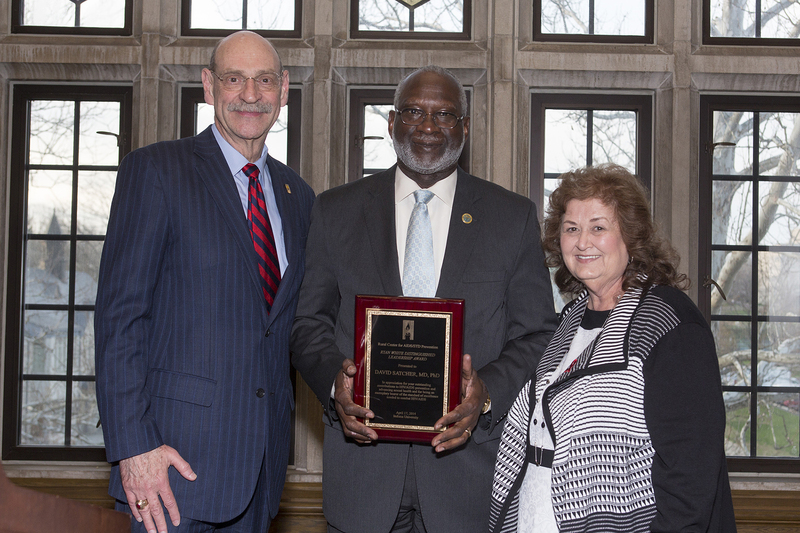 David Satcher, MD, PhD, received the 2014 Ryan White Distinguished Leadership Award at the RCAP 20th Anniversary Celebration event in April 2014. Dr. Satcher became the 16th Surgeon General of the United States in 1998 and served a four-year term. In 2001, Dr. Satcher released the report, The Call to Action to Promote Sexual Health and Responsible Sexual Behavior. The report was widely praised by sexual health professionals throughout the country. Prior to becoming Surgeon General, Dr. Satcher served as Director of the U. S. Centers for Disease Control and Prevention and president of Meharry Medical College. Dr. Satcher currently serves as Director of the Satcher Health Leadership Institute and the Poussaint-Satcher-Cosby Chair in Mental Health at the Morehouse School of Medicine in Atlanta. Dr. Satcher is highly praised as the Surgeon General who listened to American people and who was dedicated to making public health work for all groups in the United States. Otis R. Bowen, MD, received the 2012 Ryan White Distinguished Leadership Award from RCAP. The award recognizes Dr. Bowen's contributions to efforts in the 1980s to raise public awareness of AIDS at a time when little was known about disease. Bowen, former governor of Indiana, was secretary of the U.S. Department of Health and Human Services during the early part of the epidemic and was instrumental in supporting then U. S. Surgeon General C. Everett Koop in his successful effort to send an informational AIDS pamphlet to every home in America. Koop received the 2010 Ryan White Distinguished Leadership Award. Otis 94, received the award March 13 at his residence near Bremen, Ind., where he retired after an active career in medical practice, politics and academic, where he was professor of family medicine at his alma mater, Indiana University. James W. Curran, MD, MPH, received the 2011 Ryan White Distinguished Leadership Award from RCAP at RCAP national conference, April 2011. Dr. Curran is Dean and Professor of Epidemiology at the Rollins School of Public Health, Emory University, since 1995. In 2009, the Deanship of the School was endowed in his honor and he holds the position as the first James W. Curran Dean of Public Health. Since 1997, he has also served as Principal Investigator and Co-Director of the Emory Center for AIDS Research, funded by the National Institutes of Health. Dr. Curran has been author of more than 260 scientific publications. He is immediate past Chair of the Office of AIDS Research Council of the National Institutes of Health. Dr. Curran came to Emory from the U. S. Centers for Disease Control and Prevention where he served for over two decades. From 1981 to 1995 he was a leader of CDC's HIV research and prevention efforts. Dr. C. Everett Koop received the 2010 Ryan White Distinguished Leadership Award from RCAP on March 17,2010. Jeanne White Ginder, whole son Ryan's battle with HIV made him a national hero in the fight against AIDS, and RCAP senior director, Bill Yarber, presented the award to Koop at the Dartmouth Medical School in Hanover, N.H. While serving as US Surgeon General in the 1980s. Koop was the first federal authority to provide clear and explicit information about HIV transmission and prevention. He mailed a pamphlet, "Understanding AIDS," every household in America, including the rural communities served by RCAP. Click here to see the new release from Indiana University about the award presentation. Click here for a video of the presentation of the Ryan White Distinguished Leadership Award and an interview of Dr. Koop. Jill S. Waibel, MD, received the 2010 Ryan White Distinguished Leadership Award from RCAP at the remembrance event of the 20th anniversary of death of Ryan White at Indiana University, April 2010 (see News item below). Dr. Waibel was a teenage friend of Ryan White who helped him gain acceptance in the Hamilton Heights School District in Cicero, Indiana. She founded the Indiana University Dance Marathon in 1991, now an annual event that raises money for the Riley Hospital for Children in Indianapolis, Indiana and the Ryan White Infectious Disease Center at the Indiana University School of Medicine. The Indiana University Dance Marathon is the second largest campus dance marathon in the country and has raised over $8.5 million. Dr. Waibel is a dermatologist in Miami, FL. Click here to learn more about Dr. Waibel and the event in which the award was presented. The first recipient of this award was Jeanne White Ginder, Ryan White's mother. Jeanne became an advocate for HIV/AIDS education and an activist for the rights of persons living with HIV/AIDS after her son was banned from school. Jeanne continues to make presentations in the United States and worldwide on issues dealing with HIV/AIDS prevention. Ryan had an enormous presence, and that presence continues through his mother. During Ryan's ordeal and his fight to stay alive and to educate others, his mother stood by him. Jeanne White Ginder is a most deserving first recipient of the Ryan White Distinguished Leadership Award. The award was presented to Jeanne at the RCAP 2009 national conference by Dr. Robert M. Goodman, Dean of the School of Public Health at Indiana University and Dr. William L. Yarber, RCAP Senior Director.